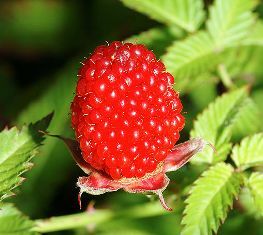 Balloon berry is believed to have been originated in Japan or China. It grows in open spots in woods. Balloon berry is a beautiful plant having many advantages. It deserves to be domesticated. Leaves narrow, glabrous, compound, light green, pretty; leaflets 5-7, oblong-lanceolate, acuminate, duplicate serrate, pilose on the veins beneath, otherwise nearly glabrous. Flowers terminal and axillary, solitary or few, bracted; white, large, 4 cm across. Fruit red to scarlet, edible 2.5 cm wide. Balloon berry fruits are edible and eaten. But sweetness from sugars is dominated by high acidity and these fruits therefore the taste sour. So these are mostly eaten cooked. The fruits can be made into jam, sweets and syrups. 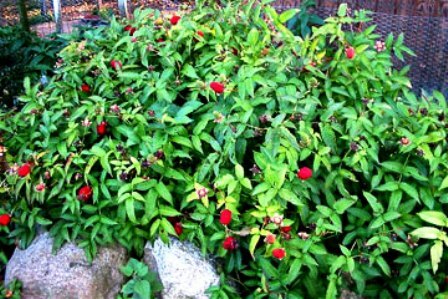 Balloon berry is quite easy to grow. The soil, however, should not be wet and there should be plenty of sun. This plant can be a little invasive sometimes. This plant makes a very good ground cover too with its with ornamental light green, narrow leaves. New plants can be raised by division. In the North, balloon berry shrubs are usually killed to the ground level due to severe cold each winter. 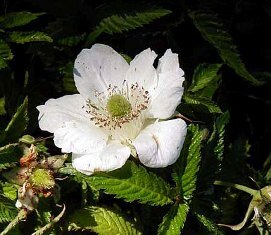 But shoots reemerge and bloom from summer until frost, usually ripening fruits at the same time.